Today 27 August 2013 All Hindu People Celebrate Shitla Satam,And go to doing Pooja to Shitla Maa . This vrat is observed in the month of Sravana on the seventh day of the dark fortnight. On this day Shitalamata’s puja is performed after taking bath with cold water. One cold meal is eaten during the day. 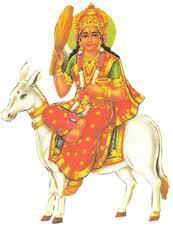 It is written in the Skand Purana that donkey is the vehicle of Shitalamata. Shitalamata holds a broom in her one hand and a kalash (container with water) in her other hand. The one who observes the Shitala vrat bathes in a river or in a lake. There Shitaladevi’s image (murti) is placed on the banks of river or lake. Shitaladevi is offered cooked food and ghee. On this day cold food is eaten; the food that was cooked the previous day (cooked on chhatthi or sixth day). For the vratdhari (one who observes this vrat), it is forbidden to eat warmed or hot food on this day. Those who can afford it, can make golden image of Shitaladevi and together with the image of the vehicle (donkey) place the devi’s image on eight petalled lotus flower. Offer obeisance with joined palms saying ‘My pranam to Shitaladevi’ and make puja. In some places people offer raw flour and gor (molasses) as naivedya to the devi. It is customary to eat only one meal on Shitala Saptami day. May a legal holiday of faith! Sab kuch Achha hi Achha ho! May your life be filled with happiness on this pious festival of Hindus. Shitle Har me Papm,Putra Putra Sukhprade ! Dhan Dhanyaprade Devi Poojagruhani Namostute! !